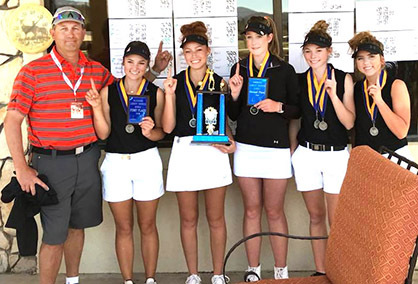 Through much of their season, making the rounds to tournaments in Southeast New Mexico, the Artesia High School golf teams tend to see a great deal of the same opponents. But the two-day Leroy Gooch in Ruidoso generally draws a more diverse crowd. In addition to the familiar faces of squads like Lovington Clovis and Alamogordo, the Lady Bulldogs found themselves squaring off against teams like Deming, Socorro, Ruidoso, Silver and Hot Springs, as well. The boys’ field was even more loaded, with all four Las Cruces high schools, Tucumcari and Mescalero in the mix, as well. 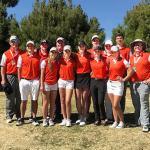 It all served to make the Artesia golfers’ placements all the more impressive, as the Artesia girls bested their closest challengers – Clovis and Deming, who tied for second with a two-day total of 737 – by 79 strokes, winning the Gooch with a cumulative 658, 328 on Day One at The Links at Sierra Blanca, 330 on Day Two at Cree Meadows. “Our girls proved a point,” head coach Dusty Bean said Wednesday afternoon. “We had some teams in this tournament that we don’t normally have around very much. Deming we didn’t know very much about, but we knew they were talented. You see their scores on paper, but you don’t ever really know how you match up. Both the Lady ‘Dogs and Bulldogs had a few issues with their putting overall on the weekend, partially attributable to the dry, difficult conditions on all of the Ruidoso courses. Artesia senior Josey Jackson was behind her cousin – Deming’s Presley Jackson – after the first day of competition but rectified that at Cree Meadows to finish first overall individually in the tournament. Jackson shot a 76 at The Links and a 77 at Cree for a two-day 153. Just behind her in second was sophomore Taysea Powell (77-82=159), followed by Brehnan Davis (86-77=163) in fourth overall, Christa Bratcher (89-98=187), and Brile Ybarra (100-94=194). The Bulldogs were unable to achieve their goal of securing their third and final team leg for the state tournament but had that problem in common with all of the other 15 teams at the tournament. The Wildcats’ two-day 640 was 23 strokes better than second-place Lovington’s 663, 32 under the ‘Dogs’ 672. The Artesia boys shot a 334 Monday at Alto and a 338 Tuesday at The Links. Two Bulldogs were able to secure their third and final legs individually: seniors Wesley Davis and Parker Sanders with rounds of 80 on Day Two at The Links. Sanders finished the tournament with a combined 161 (81-80), followed by Davis (82-80=162), Clay Houghtaling (83-86=169), Canon Carter (88-92=180) and Hector Flores (92-100=192). The AHS golfers will now prepare to hit Rockwind Community Links in Hobbs Monday, followed by a trip back to NMMI in Roswell Friday, and Bean is confident the Bulldogs will have punched their ticket to state by the time the week is up. “It’s just a matter of time,” he said. “We’ve had some rough blows here lately. We took our hits, but we’re still there. We hope to get the leg Monday in Hobbs. That’s the plan, but if not, we’ll get it Friday at NMMI.